Gigi's Cucina Povera is a Sicilian/Mediterranean restaurant in Buffalo, NY. In our "poor kitchen" the philosophy is simple: Make great food with fresh, local and seasonal ingredients, transforming the simple into more than the sum of its parts. Our menu includes Sicilian comfort food and peasant-style fare like pasta dishes, risotto-based dishes, seafood, and slow cooked meats. Daily specials feature fresh, local produce. Gigi's is owned and operated by Mary Ann Giordano. Chef Giordano has competed in many regional cooking competitions and has authored a cookbook, "The Saint Joseph's Day Table Cookbook," along with her father. Come and experience great food in a Sicilian country atmosphere. We've been here several times. Always enjoy it. Great ambiance, delicious food and good service. It's very cozy and they always have coupons available, so it's a good value as well. And the homemade Limoncello is a must; better than any we had while on a recent trip to Italy! Will be back! Live music was fantastic. Food and service amazing. We really enjoyed our time at Gigi’s. Very pleased with the evening. Pleasant experience. We thought we would try a new Italian restaurant because our favorite go to was not opened. The service was excellent. The food was ok. Very tasty dishes and nice ambiance. We enjoyed our dinner. Service and food was excellent. Enjoyed the ambiance of the restaurant. Perfect for date night. The meals were high quality, with fresh ingredients from soup to dessert. (unlike chain restaurants). Had a slight mix up on our order , however the waitress handled and resolved the issue promptly. We even received a free dessert to make up for the error. Cannoli were delicious. Had a enjoyable meal and experience. Food was good, but not great. I feel that the price for the dishes are high. Salad was the best part of the meal. There are very few what I think are traditional italian restaurants; I enjoyed this one. My girls, wife & I loved the meal. I recommend this restaurant and we would go back. The server Rachel was very knowledgeable and attentive, what you would expect in a better restaurant. I thought it was a little pricey by 20% +/-. My daughters are not huge eaters. New Years Eve dinner with my wife. The set menu had good variety. The ambience was fun, with a singer to add to the environment. The meal was excellent. I had the zuppa de pesce, followed by clams casino and an outstanding veal osso buco. Overall, great meal, fun atmosphere and friendly staff. New Years dinner. Wonderful service, food, & atmosphere. Will be back!!! Best food in Buffalo! Chef MaryAnn Giordano has outdone herself with this restaurant. Amazing! Fabulous dining experience! The food was delicious and the service was exceptional. I really like the motif of the restaurant with the murals on the walls. You feel like you are in Italy. They also have live entertainment on certain nights. I definitely recommend visiting GiGi Cucina Povera. We had an early dinner which was great because we didn't have to wait long at all, plus we reserved our table on line. I had the penne con vodka which was awesome and my husband had the spaghetti and meatballs. He said it was good, but he's had better. He didn't have a lot of sauce on his pasta either which would have been a problem for me, but for him, it was fine. Bread was delicious! we made our reservation and enjoyed a fantastic evening. the singer was terrific , he mixed golden oldies, christmas songs and some modern songs. people were dancing (the crowd tends toward is a much older group 60-70 but there were also some young people enjoying dinner and music) my girlfriend had a blood orange martini and it smelled so good i had to try it, it was wonderful. we shared a bottle of wine which was ok. our salads were delicious. the dressing light but very tasty. my husband had the wedge and said it was the best he ever had. we all loved our entrees. our evening was simply perfect. we will not wait a year to return. Our second time at Gigi's. Wonderful evening!! The food was great the music was great. Our server Theresa was fantastic!! Our new place ! Three of us ladies go when Joe Rozler is playing, order a table full of appetizers and a nice bottle of wine. Perfect evening ! 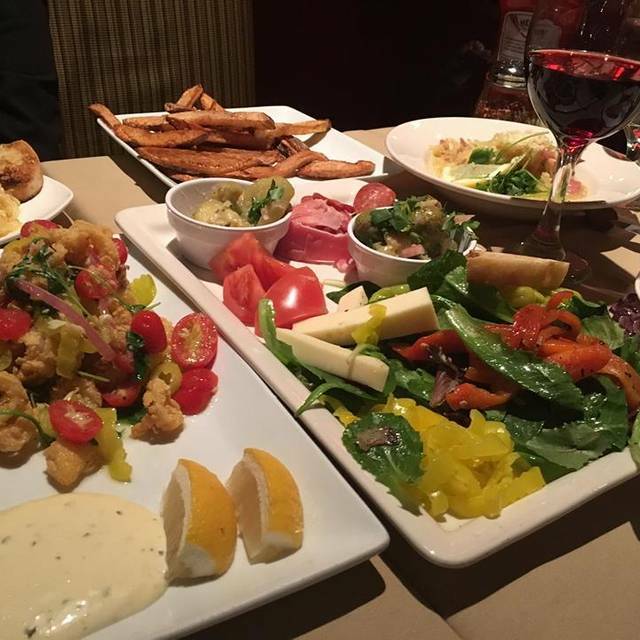 Calamari's aioli is the best in ever, the antipasta board is divine, pizza is great . The best thing is the service , our waiter on Wednesday was just the best . Prompt, funny, helpful and nice !! Waitress was awful forogt some of our order had to ask for it twice. Also ordered gluten free pasta and it was way under cooked. Will not go back!! We come to Gigi's often and we're never disappointed. The food is made with care and the atmosphere is comfortable and inviting. They have a delicious lemon drop martini I have every time, and their house salad is my favorite salad of any restaurant in the area. The main course selections are varied with excellent specials, but my go-to is their eggplant parmesan, done just the way I like it. The dessert choices are indulgent... last time was a flourless chocolate cake, served with just the right amount of whipped cream and a raspberry... Great place for a wonderful meal. Had a lovely evening. Food and wine delicious. Best fish fry in the world!! Good food,good service, good atmosphere, what more do you want!!! We loved it. All around terrific restaurant. Wish we had saved room for dessert, which are made in-house. Great staff, food and Jeff at the bar was amaz-ing!! Our meal was delicious, and the portions were generous. Our server was excellent and we were seated within seconds of arriving at our reserved time. Will return and will refer friends. Very good soup that is included and fresh bread with oil and spread. Perhaps it was a bad night in the kitchen but my eggplant parm arrived an hour after I arrived and although the eggplant was hot the pasta and sauce were not. I left. Food was very good. Service wasn’t as good. The server was very nice but we had to ask her twice to get Parmesan cheese and it took forever to get our bill. She seemed to be more focused on the large party in the back room. Still left a decent tip, but then when I checked my bank account, she gave herself an extra $5! Next time I will use cash. A very nice and cozy restaurant with good service, great food and a nice ambiance. Very generous portions for a fair price. Definately going back again. It got too loud with the live music but was great otherwise! First time at Gigi's and probably my last. Went with a party of 3. Service was painfully slow for less then a dozen tables and 3 wait staff. Took a good 15 min to even get water and longer for drinks. It was well over 30 min before our food order was taken. It was well past an hour before apps came out. The food was so-so. My wife had the chicken Milanese which the chicken was tender and had good flavor but the pasta was bland. My sister in-law had the steak sandwich and fries which was good. I had the pasta carbonara and it was just terrible. It was swimming in watery liquid. It was covered in parsley, had no cheese flavor, and zero silky feeling you get with carbonara made with eggs, butter, and cheese as listed on the menu. The little bit of pancetta in the dish was soggy and had no taste. Picture/taste salty watery spaghetti with parsley and you have your dish. The few drinks we had where ok but pricey for what you received. The bread was homemade and decent but both the dipping oil and the olive tapenade where very bland and needed salt and pepper from the table to add flavor. We skipped on desert as we where already there for 2.5 hours just for dinner and had to leave. Overall I would give the overall food 4/10, service 1/10, and value for the dollar 3/10. The overall ambiance is nice, music at a decent level, and menu looked good. The scallop dinner wasn't what was expected. They were gritty, seemed to be not completely cooked and the polenta was cool (not hot). The eggplant parm was ok, sauce ok and the spaghetti dinner needed more sauce to cover the pasta. Tables looked to be getting full when we left but would not recommend. If I had a gift certificate may try again, it could have been an off night for the restaurant. Nice restaurant, good food and ambiance. Disappointed that a special item was already sold out at 7:00pm. All around nice dining experience. Excellent food and service. Banana peppers need work. Smaller, intimate spot for food and entertainment. Chef Maryanne has created a menu made with love from more traditional Sicilian dishes. She supports the Jazz community with live entertainment fairly often. Her St Josephs table is amazing...not to be missed. A very good wine list, knowlegable and warm staff complete your dining experience. Always a deliciously prepared meal with friendly and knowledgeable servers. The live music from Just Johanna was wonderful . We’ll definitively be back soon . Food and service were exceptional....authentic Italian cuisine!! Our waiter John was a delight!! We will definitely be back.... would rather support a local gem, than a restaurant chain! We really enjoyed our experience. Restaurant was lovely decor and everyone dining seemed to be enjoying being there. We had a wonderful waitress who was friendly, knowledgeable and attentive. The food is delicious! Portions are very substantial! This place is a perfect place for any night you don’t want to cook. Prices are far. Great wine selection. Can’t wait to return!